*On the eve of another meeting of the state task force reviewing “stand your ground,” the parents of Trayvon Martin have launched a new website and political committee aimed at changing the controversial law, reports the Orlando Sentinel. A new committee of continuous existence, or CCE, called “Change for Trayvon” and a corresponding website will collect funds to “be distributed to candidates, elected officials and efforts which support the mission of… revising Stand Your Ground laws across the nation to ensure there is judicial or prosecutorial oversight,” the site says. The new website also includes a video with Trayvon’s parents, Tracy Martin and Sybrina Fulton, and PayPal links for donations. “Something has to change, which is why we created the change for Trayvon Martin movement, to shine the light on stand your ground laws across the nation,” Fulton says in the video. Trayvon’s shooting drew international outcry after police initially did not arrest his shooter, George Zimmerman. Zimmerman says he fired in self-defense, after the teenager from Miami Gardens attacked him Feb. 26 in Sanford. 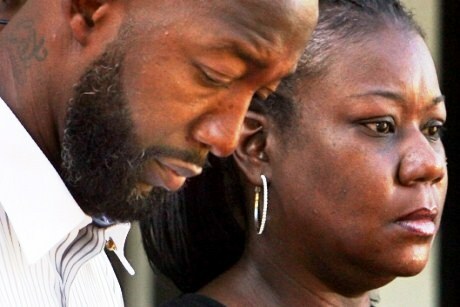 Prosecutors and Trayvon’s family say that Zimmerman profiled, pursued and shot the teen. The “stand your ground” law grants immunity if a defendant can show the use of deadly force was in response to a reasonable fear of serious injury or death. The law is controversial for several reasons, including the immunity language and the lack of a requirement to retreat if possible before responding with force. Critics contend it encourages violence, and leaves police agencies reluctant to make arrests in cases where there is a self-defense claim. Supporters say the law empowers law-abiding citizens to better protect themselves. The CCE announcement comes the day before the Task Force on Citizen Safety and Protection, which is reviewing the law in the wake of the controversial shooting, will meet for the sixth time Tuesday in Jacksonville. The evidence that has been made public indicates the thug got what he deserved. Now his parents are going to lobby and financially back politicians that are against citizens defending themselves, they complain about the NRA doing the same thing, except obviously they are pro defense. No you fkn didn’t!!! WTF are you calling a “thug”!!?? You racist bigot muthafkah, who even “told you about” this site!? Imma keep it short & say?…..1st? FK youuuuu, 2nd, you & YOUR kind are the fkn “thugs” & 3rd?, your attempt at “high jacking this site” with BS, won’t work & you have just been exposed…..bytch azz “troll”. Now skip yo stupid azz back to the pack you come from & tell’em….that. FOH! All Day!! There is no evidence for CERTAIN what happened to Trayvon Martin was warranting as STAND YOUR GROUND, and HIS(trayvon) due process was violated under LAW, and this is why the police CHIEF and others were FIRED or removed from the case..
George zimmerman Profiled- Pursued and (IMPO) started provocation and as result a UNARMED teen ager was murdered. When in fact the PD told zimmerman to NOT approach the teenager who was heading HOME minding is OWN business..
You racists morons are the worse, you PP still believe in lynching ands LIEING as a way to justify murdering someone as like the KLAN did for over a century.. WELL your time to stop this EVIL thinking ans murdering BLACKS is OVER.. and americans will fight you azzholes to the bitter end.. George Zimmerman deserves to be in prison…for murdering a unarmed teenage he profiled, pursued into provocation and SHOT Trayvon. Yes I am watch!…….FK youuuuuuu TOO!!! Need translation? Read/understand/”get it”!!?? You AND yo weak azz racist friend can go….fk a duck. And to the both of you I say…FOH!, yuh trolls. Aaaaaaaaand “scene”. The End. Trying to change a self-defense law that the vast majority of citizen approve of is a losing cause. If GZ is convicted then what would be their reasoning for changing the “stand your ground law.” When this case goes to a judge or jury and self-defense is rule then it would be time for them to launched a campaign to change the “stand your ground law” in their state first. Why are they asking for money for something that has not happen yet and will not affect GZ case? The parents of TM are foretelling by their action that they know this was self-defense on GZ part. Y’all sing it wit meh?….1 troll, 2 trolls, 3 trolls, any more!?? SMHATSMFkahs!